This is the time of year when everything seems to pile on me at once. Right now I have assessments, parent -teacher conferences, report cards to start and I still have two new curriculums I'm trying to learn. I've got my math work stations going and hope to have the literacy stations started after Thanksgiving break. It feel like November is already over and it is only the 7th. Next week is our last week before we leave for Thanksgiving break, and it is only 4 days. I had so many great activities I wanted to do with my kids, but I just don't think I can squeeze it all in. I haven't even had time to rotate my Thanksgiving math centers into the rotation. 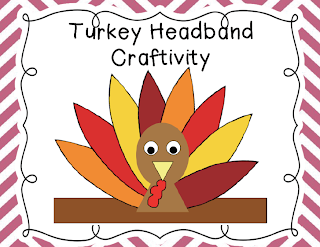 No matter how busy I am, I will be making this turkey headband. My kids love headbands and it is a great way to incorporate some art and patterning skills into one lesson. I think after we make our headbands we will parade about the school just to show off. I just blogged about this super cute idea! Can't wait to make it on Monday!